A bundle of pleasant ironies, Ridgewood Hotel basks in a seeming anonymity when side by side the big boys and girls in the industry. Quaint yet exquisite, laidback and provincial yet bustling and modern. There’s something about the place and the service that lets your guard down – but not excessively, and lets you luxuriate – but not obtrusively. Opened in February 24, 2005, Ridgewood Hotel is built to exude a homey ambiance, accentuated with log interiors, and the crisp mountain breeze. Where weekend getaways happen, social functions are memorable, and business meetings successful, the unabashed anonymity may be or must be a desirable welcome treat. 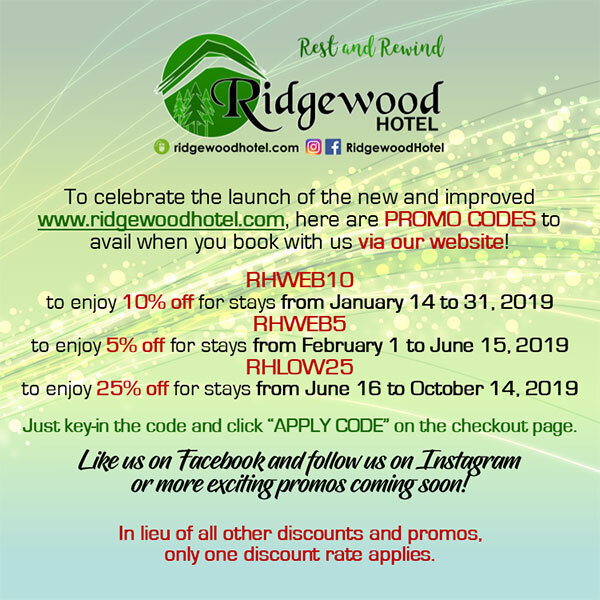 Ridgewood Hotel is owned and operated by 5R Holdings, Inc.
#RestAndRewind with bar-chows, beer, cocktails and other beverages at our restaurant-cafe on weekend evenings while some of the best Baguio home-grown acoustic acts entertain you. Bring the barkada for a night of clean fun. Walk-ins are welcome! Plus, enjoy Breakfast Musicals (a Ridgewood Hotel original) on special red dates and celebrations. Quiet Cafe DiningHave your daily dose of caffeine with a variety of concoctions using Benguet Coffee, or relax while taking a sip of special select teas. I have stayed here for 2 days and 3 nights. I thought I was paying too much but my money went to a worthy place to stay in Baguio. The place is located at a non-busy area of Baguio with a lot of trees around. I was looking for a homey place with free breakfast and with a veranda view facing the trees. I got it all here in Ridgewood. The food is great, the service is amazing, and the homey feel is there. It was my home, I love it here.